Heat oven to 375°F. In large bowl with electric mixer, beat granulated sugar, brown sugar and butter until light and fluffy. Beat in vanilla and eggs until well blended. Beat in flour, baking soda and salt. Stir in chocolate chips. 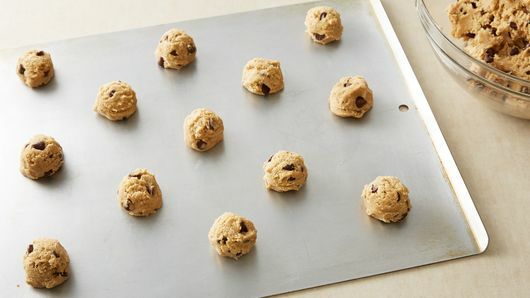 On ungreased cookie sheets, drop dough by rounded tablespoonfuls 2 inches apart. Bake 8 to 10 minutes or until light golden brown. Cool 1 minute; remove from cookie sheets to cooling racks. Since this is a big-batch recipe, freeze half of the dough. Drop the dough by spoonfuls on a baking sheet and freeze. Once the mounds of dough are frozen, place them in an airtight container and freeze. 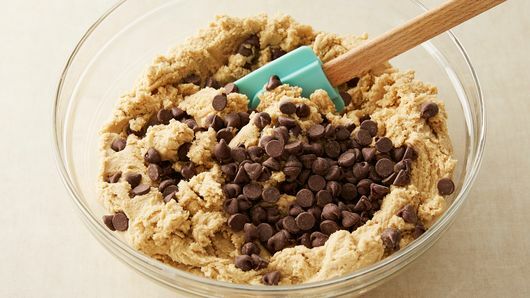 When it's time to bake the cookies, add about 5 minutes to compensate for the frozen dough. Portion dough out with a large measuring spoon or a small meatball scoop (about 1-inch in diameter). Making the dough balls consistently the same size helps the cookies bake up at the same time. Be sure to give them enough room to spread on the baking sheet too. The ratio of granulated and brown sugar to the butter affects the cookie’s texture and how they brown. Watch the first batch, removing them from the oven just as they turn a golden brown, allow them to cool, then decide if they’re as soft and chewy as you’d like. If not, bake them a little less. Cooling cookies and other baked goods on wire racks allows air to circulate under them. Otherwise the heat from the cookies cause them to sweat on the bottom and get soggy. 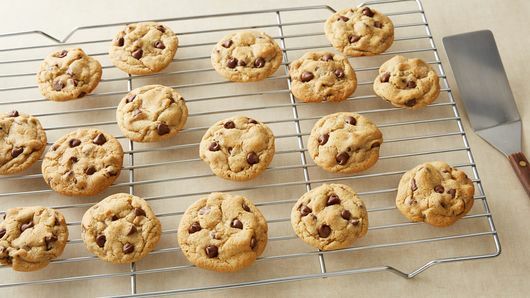 If you don’t have cooling racks you can transfer the warm cookies to a chilled baking sheet lined with paper towels. Or use a cooled wooden cutting board. Anything to cool the cookies down quickly. 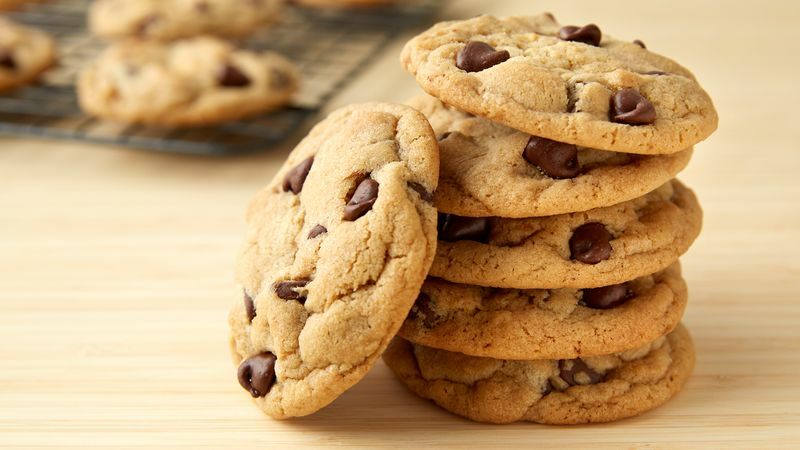 Chocolate chip cookies made their first appearance in American households in the late 1930s, originally created to accompany ice cream, and quickly stood out on their own to become the staple for sweet tooth-satisfaction. To this day, nothing says comfort like a fresh batch of warm chocolate chip cookies. Whether you like ‘em plain (ain’t nothing wrong with that!) or hacked into bars, cheesecakes and other tasty treats, use our no-fail from-scratch recipe or pick up a roll of our dough from the store and get ready for deliciousness. Are you a baking rookie? Not to worry! We’ve got you covered with a step-by-step guide to all the basics for cookie success, from icing and decorating to freezing and storing leftovers, plus tips and tricks for all your favorite classic cookie recipes.